Christmas is tomorrow, but it's never to late to treat yourself! 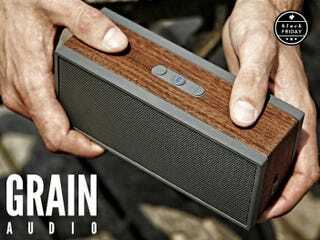 For a short time, Gizmodo readers can get one of the most unique, high-end bluetooth speakers on the market – Grain Audio's PWS – for 25% off plus free shipping with the StackSocial code "graingiz10". ^ Need we say more? The Grain Audio PWS is always $250, but Gizmodo readers can get it for $189 by using the StackSocial coupon "graingiz10". It also includes FREE shipping inside the US.